Registration packets of keepsakes including the Encinian 2009 Yearbook with senior photos of each classmate attending. A Memorabilia Table displaying vintage Apache attire. An In Memory display honoring our classmates who have passed away. A Self-Serve Photo Center where classmates took Polaroid pics & placed them in our Self-Serve Photo Album. Classmate photo centerpieces that classmates could take home. Two psychedelic bars for refreshments. Special guest, Mr. Jack Carey, 1969 Encina Music Department Chairman. -Jane Larson (Smith) won a night at the Holiday Lodge in Grass Valley donated by Janet Ralph (Douglas) and a $25 gift certificate for being the first to join our class website. -Laurie Thacker (Pennacchi) won a GPS donated by Paul Carlson for being the first to buy a reunion ticket. -Myke Lance won an iPod nano 3rd generation for traveling the furthest to attend our reunion (all the way from Vienna, VA). -Shirley Ward (Rust) won an iPod and jewelry handmade and donated by classmate Stephanie Marks. -Pam Pryor (Gleitsman) won four framed 1960's collage posters made and donated by Deborah Carlsberg (Foster). -Linda Sheppard won a $25 gift certificate and a case of prune juice donated by Rich Harris. -Daniel Ward won the grand prize, a Wii donated by Lynda Benvenuti! The best highlight of all...seeing how much fun everyone had reminiscing, chatting with others, dancing, and just having a great time! GO APACHES!!! All our classmates that bought tickets to our reunion because without you, it couldn't have happened! The many classmates who donated to our Reunion Fund allowing us to offer reasonable ticket prices especially considering all that was provided. Those classmates who donated prizes to help make our reunion even more fun! All the Sacramento Hilton Arden West staff who supported us throughout the many long months (approximately 17!) of preparing for our reunion and their outstanding support during the evening of our event (we highly recommend the Sacramento Hilton Arden West to anyone wanting an outstanding venue to hold a special event!). Valerie Reese (The Balloon Butler) for the wonderful balloon decor. Dave & Cindy Arsenault who provided the classic 1969 mustang on display. All our Registration Desk workers - Tom Barcus, Michelle Biaggi-Taricco, and Dave & Cindy Arsenault. Our photographer, Brian Morris, of BriTai Image Factory. Raines Video Productions who videotaped our reunion (order your DVD today!). And ClassCreator.com for supplying such a powerful and easy to use application which made this website possible allowing us to coordinate our reunion in the most fun and efficient manner possible! Self-Serve Photo Center Slide Show! 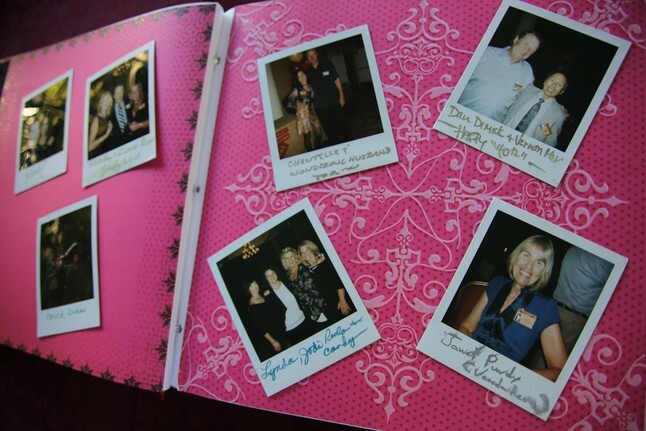 In April, 2008, the Reunion Committee started plans for our 40th reunion held on October 3, 2009. Approximately 18 months later, in November, 2009, we completed our 40th Reunion Project! Sent classmates an initial notification of the reunion, verified their contact information, and solicited feedback. Created overview and detailed reunion project plans. Created this new Encina Class of 1969 website. Researched 11 potential reunion sites. Narrowed potential sites down to the Hilton Sacramento Arden West Hotel and the Del Paso Country Club because they both have separate areas (one for the band and dancing and another more quiet area for chatting). Chose the Hilton Sacramento Arden West since over 60% of classmates that indicated they are interested in attending the reunion live out of town and due to the significantly lower costs. The Hilton Sacramento Arden West just completed a 4 million dollar renovation and is looking good! All reunion attendees also qualified for their "Take The Elevator Home" discount on guestrooms (a total of 24 guestrooms were booked). Signed a contract with the Hilton Sacramento Arden West to hold our reunion on Saturday, October 3, 2009, which was the closest available date to the month of September which most of those classmates responding to our survey indicated would work best for them. Paid the $1000 deposit due the Hilton. Researched several bands to play at the reunion and chose alumni Chuck Dunn's band, The Blues Monsters, to provide live entertainment for our reunion. Check out their website at www.thebluesmonsters.com. Opened a reunion checking account. Opened a reunion PayPal account. Created a Reunion Donations page to encourage donations to help lower our reunion ticket price. Finalized the reunion ticket price structure. Hired photographer, Brian Morris, of BriTai Image Factory. Hired videographer through Raines Video Productions (the same company that videotaped our 20th reunion their very first year in business!). Decided on our reunion theme: Apache Spirit - Once Apaches, Always Apaches! Designed magnetic, photo name tags. Received the band contract and list of "oldies" they will play. Attended several appointments with our Hilton contact to go over reunion details. Created an iPOD playlist of tunes from our high school years to play during the reunion when the band is not playing. Collected donated prizes for our reunion. Completed our efforts to find missing classmates. Contacted all classmates who indicated they were planning to attend our reunion but had not yet purchased ticket(s) to encourage them to purchase their ticket(s) right away. Raised $2,891 in reunion donations! Discontinued ticket sales on 9/17/09. Made final preparations for our reunion. Held our event the evening of October 3, 2009, which was a fantastic success! Our best attended reunion with approximately 130 people attending! Met for our post-reunion meeting on Saturday, October 24, at BoBo Cafe on Fulton Avenue, to review what worked well and what could be improved. Posted slide shows of pics from our reunion to our class website. Created links on our class website to enable the download of photos from our reunion and the ability to order high-quality prints from our reunion photographer. Posted our Encinian 2009 Yearbook to our class website. Sent DVD order forms to classmates for whom we have addresses. Held approximately ten reunion meetings total. 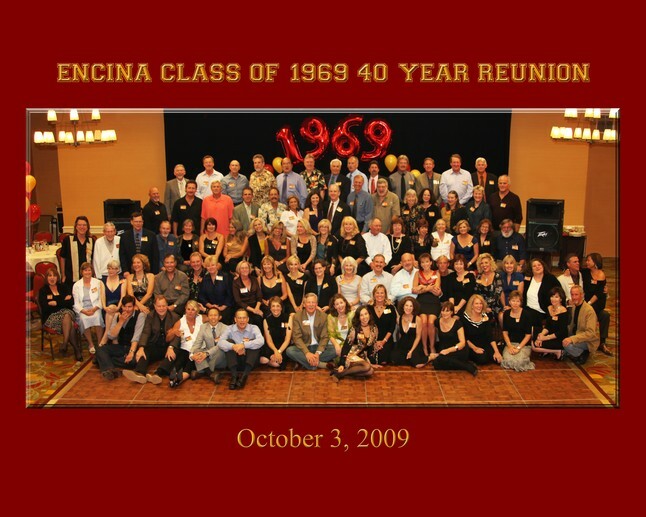 Closed our Encina Class of 1969 40th Reunion Project!